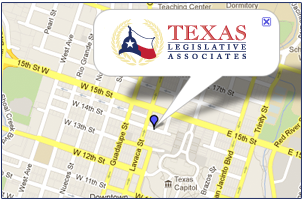 Texas Legislative Associates is one of the premier independent lobby firms in Texas. Texas Legislative Associates is located in the historic Wahrenberger House which is found on the western edge of the Capitol grounds. Develop a strategy to interact with industry associations in promoting clients' legislative priorities to gain support and reduce roadblocks. Our expertise includes the ability to bring like minded entities together to develop a strategy for success while acting as one voice in front of the legislative bodies and regulatory agencies. Texas Legislative Associates understands the intricacies of Texas government and has shown significant success in working with both the Legislature and state agencies.The firm is noted for its in-depth knowledge of the political and legislative processes that affect the balance of power in Texas. More than 30 years of experience enhances the firm’s ability to represent those who have vital interests pending before the state of Texas. Our team of former legislators and agency executives offer our clients extraordinary access to key policymakers and a unique understanding of the critical issues pending before the Texas Legislature.The following is an outline of the governmental services that are available from the firm. These activities will be tailored to meet the needs of the client once priorities and goals are established. Texas Legislative Associates has specific experience in legislative issues including Health Care Reimbursement, Margins Taxes, Alcoholic Beverages, Energy, Trade Associations, Professional Licensure, Agribusiness, Communications, Insurance, School Finance, Education, and Non-Profit advocacy. We would enjoy tailoring a plan of action to meet your specific needs.